Approach: The Tuckamore Simulation Research Collaborative (TSRC) conforms to the idea that the whole is greater than the sum of its parts and success is based on many components. The TSRUC has 6 core pillars for success. Students experience integration in the pillars of mentorship, research facilities and networking. Students participate in simulation case development and scenario completion, and novel research design and manuscript preparation. Students take on existing initiatives or approach faculty with new ideas for research. The framework for the TSRC allows expert guidance while providing adequate room for autonomous student research. This objective is to outline the innovative process of successful student involvement in the TSRC. 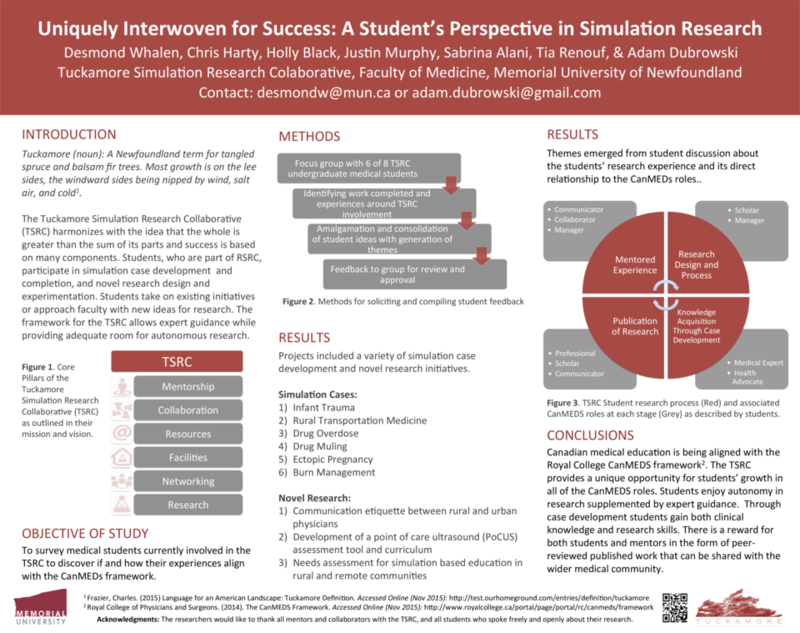 Methods: Students are paired with a mentor in an area of medical simulation. Student and mentor agree on a research goal and plan for proposed outcomes. Students then network with other research partners to achieve project goals. There is variability in how each project proceeds based on project, mentor and student styles, but communication and collaboration result in scholarly success. Results: Since the development of the TSRC in 2013, there have been a variety of student research initiatives in medical simulation. Projects include simulation scenarios in infant trauma, transportation medicine, drug overdose, drug muling, and burn and fluid resuscitation management. Additionally, novel research is underway in communication barriers between rural and urban physicians with a role for simulation, point of care ultrasound assessment tool and curriculum development, and a needs assessment for simulation in rural and remote communities. Several of these cases have been published with others being presented at conferences nationally and internationally. Analysis/Conclusion: Medical education is driven by the Royal College CanMEDs roles and medical simulation is no different. The TSRC pillars of networking, mentorship and research facilities directly equate to the Royal College CanMEDs roles. Students enjoy the experience because of dynamic mentors who allow autonomy while also being available for advice. Students gain valuable academic and clinical skills through developing a clinical armamentarium and communicating results in an academic fashion. The process offers reward for students and mentors by resulting in a concrete product which can be disseminated to the medical community.